Sometimes, after finishing a painted art project and having used paper towels to clean up, you notice that the paper towels are a beautiful print. Instead of throwing them away, you can use them to make these painted paper towel cats. Or, you can stain the paper towels specifically for this project, as I did for these cats. The Cats are made using stiffened paper towels. 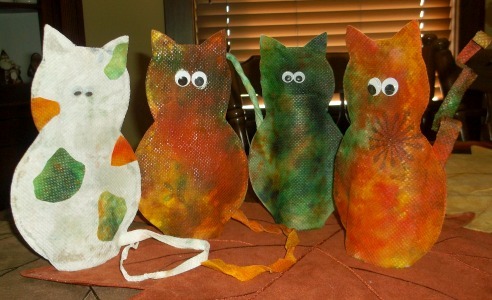 Find the instructions for this project, Stained Paper Towel Cats, in the Miscellaneous Gallery in the sidebar. Click on the image above for a larger view. This entry was posted in Categories and tagged all grades, crafts, Halloween, kids crafts, painted paper towel, paper towel cats, paper towels, sitting cats, stained paper towel, stained paper towel cats. Bookmark the permalink.